Notes: SNAP stands for Supplemental Nutrition Assistance Program. 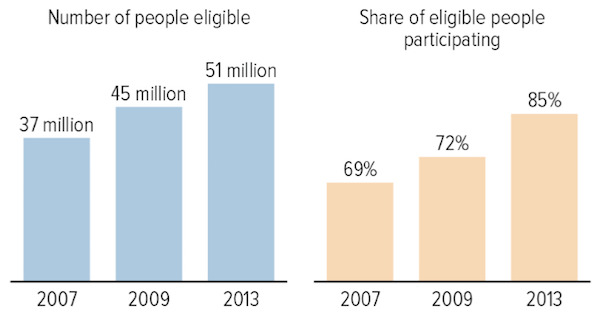 This figure uses annual Agriculture Department (USDA) estimates of eligible and participating individuals. USDA revised the methodology for these estimates starting with the 2010 estimates, so the 2007, 2009 and 2013 estimates are not directly comparable. The revised methodology does not change the underlying trends. Data Source: USDA Food and Nutrition Service, “Supplemental Nutrition Assistance Program Participation Rates: Fiscal Year 2010 to 2013” August 2015, and earlier reports in the series. This entry was posted in Data Watch on March 23, 2016 by Genevra Pittman.